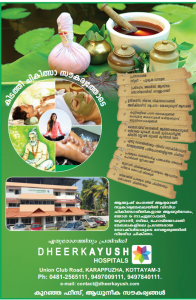 Deerkhayush is a LLP firm run by Ayurveda, Yoga Unani, Sidha & Homoeopathy therapists at Anugraha Buildings, Union club Road, Karappuzha Kottayam. All AYUSH systems serves you under one roof here. The hospital has I P Facilities with A/c and Non A/c rooms. © 2018. Dr Biju Online. All rights reserved.